Editor’s note 3/17: Harvard Professor Henry Louis Gates wrote about Kasia’s research and “hidden African ancestry” in the The Root. Check it out. Scientists have long used DNA to inform our understanding of big epochs of human change and migration. But what about the smaller changes, can DNA tell us something about recent human history? 23andMe researcher Katarzyna “Kasia” Bryc, who is also a postdoctoral research fellow in David Reich’s lab at Harvard Medical School, gathered anonymous aggregated data from our customers to look at the mix of African, European and Native American ancestry in the United States. What she discovered was an illuminating genetic portrait of the U.S. that both confirms some of what we know about America’s social history but also other things that are surprising and new. Gates was writing about something we’ve reported on in the past, the “hidden” African ancestry among white Americans. 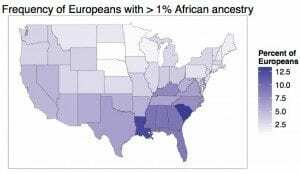 Because of the ugly history of slavery, most African Americans have at least some European ancestry. But what is less known is how many individuals who identify as being of solely European ancestry – or white – also have African ancestry. Note that we use the term “hidden,” because these individuals self-identify as white and because of their very small percentage of African ancestry, may be unaware. But some of these individuals may indeed know about that African ancestry. Kasia’s research confirmed in more detail 23andMe’s earlier findings, and she looked at how that mix of ancestry for self-identified whites, African Americans and Latinos differed from state-to-state. Taken together Kasia’s research helps fill in more detail of how migration, as well as social and racial divisions shaped America. A few years ago, Joanna Mountain, 23andMe Senior Director of Research, presented preliminary findings at an American Society of Human Genetics conference looking at the numbers of individuals who identified as white, but who had what was likely “hidden African ancestry.” In an update to that work, our researcher Kasia Bryc found that about about 4 percent of whites have at least 1 percent or more African ancestry. Although it is a relatively small percentage, the percentage indicates that an individual with at least 1 percent African ancestry had an African ancestor within the last six generations, or in the last 200 years. This data also suggests that individuals with mixed parentage at some point were absorbed into the white population. Looking a little more deeply into the data, Kasia also found that the percentage of whites with hidden African ancestry differed significantly from state-to-state. Southern states with the highest African American populations, tended to have the highest percentages of hidden African ancestry. In South Carolina at least 13 percent of self-identified whites have 1 percent or more African ancestry, while in Louisiana the number is a little more than 12 percent. In Georgia and Alabama the number is about 9 percent. The differences perhaps point to different social and cultural histories within the south. Kasia found significant differences in state-to-state comparisons. African Americans in the northern and western states have more mixed ancestry than those in the southern states. African Americans living in South Carolina have the highest proportion of African ancestry, about 84 percent, compared to those living in any other state. A significant percentage of African Americans, more than 5 percent, had at least 2 percent Native American ancestry. This is much higher than previous estimates or data from the US Census. Looking at the mix of European, African and Native American ancestry, self-identified Latinos in the 23andMe database had the most diversity in their ancestry. But again, just as the mix of ancestry among African Americans and whites differed from state-to state, so too did Latinos, which again sheds more light on their social history. On average Latinos had about 70 percent European ancestry, 14 percent Native American ancestry and 6 percent African ancestry. The remaining ancestry is difficult to assign because the DNA is either shared by a number of different populations around the world, or because it’s from understudied populations, such as Native Americans. Obviously that large “unassigned” percentage means that those “averages” could be higher. As with African Americans, looking at the regional and state-to-state numbers for self-identified Latinos, the differences are striking. Recent studies have shown that countries across South America, the Caribbean, and Mexico have different profiles of genetic ancestry molded by each populations’ unique history. According to 23andMe’s data, the United States has its own set of unique regional histories. For example, some Latinos have no discernible Native American ancestry, while others have as much as 50 percent of the ancestry being Native American. Latinos in states in the Southwest, bordering Mexico – New Mexico, Texas, California and Arizona – have the greatest percentage of Native American ancestry. Latinos in states with the largest proportion of African Americans in their population – South Carolina, Louisiana and Alabama – have the highest percentage of African Ancestry. America is a crossroads of cultures and our DNA reflects this. Kasia’s research sketches a picture of a few of those cultures but is far from offering the full genetic portrait of the people of the United States. Still her work illustrates the power of DNA – and the 23andMe database – to tell us about ourselves and our history. *Apologies to Bryan Sykes for our appropriation of the title of his 2012 book, “DNA USA: A Genetic Portrait of America.” A great read, the book is both a travelogue and a series of short profiles of people with different ancestral backgrounds, who have had their DNA tested.